I use OneDrive for my online storage. Microsoft provide unlimited space with my account so I am keen to use it with my Synology NAS box as an online copy. The NAS box stores everything on my home network. I have it setup with my user home drives from all the computers and have organised shared areas for projects I've worked on over the years, there are home videos and all our photo's stretching back over a decade. There are lots of files that I would not want to be without. I obviously want to keep them all backed up. I use a large USB disk for the primary backup but I would like to have an off-site copy. Synology provide the app Cloud Sync. It's not a backup solution but is useful for synchronising files and is the only way to get files to and from OneDrive using the NAS box. Unfortunately it has some peculiarities. I've had it running for some time now and it appears to work OK. Today I tried to synchronise an extra folder structure but it failed on every file and folder! 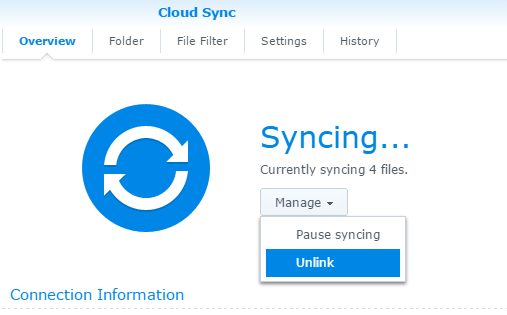 In the interface on the Synology, I could click a previously unsync'ed folder but the log in the history tab said 'Download Failed' for every file! The only way I could find to fix it was to Unlink the Synology profile from OneDrive and add a new one with a different name. If I used the same name if would create new folders but none of the files synchronised. I could select the same folder structure, so at least it appears to only be downloading files it hasn't already got. It has started to download files now but it will be a few days or weeks before everything it should download has completed!